Asher's 2008 studio recording is a singer-songwriter album of powerfully gentle, piano-based vocal ballads, orchestrated at 'The Art of Sound' studio in the Netherlands. The production and sound quality are exceptional. Asher's transparently tender and intimate voice very movingly conveys his poetic, spiritually-themed lyrics, laying bare the complexities of the human, emotional heart. These are almost transcendental ballads; particularly beguiling are the tracks 'Silently spinning' and 'If you believed in love'. My wife and I find your voice very relaxing and with a positive vibe. Really enjoyed the lyrics of the "Serpent" CD, and thought that the production and sound quality was very good. I am a fan of prog, folk rock etc. usual suspects... Fairport, Strawbs, early King Crimson, Renaissance. I am blown away. This album is one of the finest I have listened to in years. The stand out track for me is 'If you believed in love', just a beautiful song so perfectly crafted with the formation of the words, syllables and rhymes. 'Time of spiritual emergency' is probably the easiest song for most listeners to empathise and agree with, and your versions of the native American Indian 'Morning sun' and 'The river is flowing' are magical. Your ability to paint these lovescapes has got richer in textures of honesty within the heartlands of one's mind. Thank you so much for sharing these songs, they still have the embroidery of spiritual thread woven through most of them. Others have the spirit of the travelling story-teller sitting round the night fire. It's been a wee tonic for me, Asher. I cannot get enough from 'If you believed in love'... this words you have used are so true, and in some nights when I can't sleep I hear this song sometimes over one hour... it gives me so much intensity. I really must say how much I'm enjoying Asher's new CD! 'Ancient grief' and 'Sweet dreams of the ancient ways' are so far my favourite tracks. 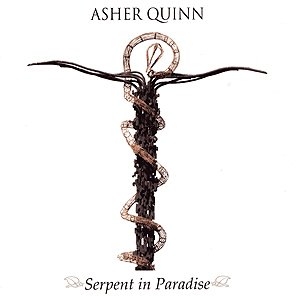 Hi Asha, Serpent in Paradise has arrived. My English is not good enough to express your angelic music and style. It came on the day Croatia lost the football match to Turkey, and I calmed down myself listening to 'If you believed in love'! I love your 'Silently spinning'. Great composition!! Congratulations on Serpent in Paradise. It has to be the best album yet. Your rendition of 'Morning sun' is truly exquisite, indeed the whole album is infused with great beauty, heart and spirit.